You have found the right place to locate your next DREAM RV or to enhance or modify your current American Made RV (Recreational Vehicle). 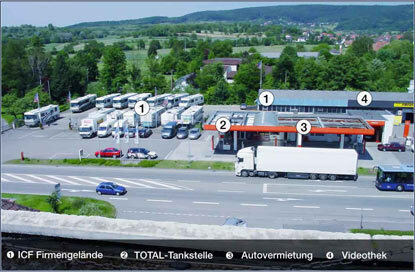 We are located in Emmendingen, Germany. This is in the Black Forest region, very close to France and Switzerland. ICF-US-Motorhomes is a Family owned and operated Business and has been in Business more than 28 years. The Company was established in year 1990 and appertains to one of the oldest Dealer for American Motorhomes in Germany today. We started with a small customer base with the Sales and Service of American RV's. At the present day we have customers all over Germany and even European Countries such as: France, Switzerland, Spain, Norway, Belgium, Sweden, Russia and many more. Beside the Sales and Import of American Made RV's, we also have a full Sevice- & Repair facility. We specialize in the sales of USA RV Parts, Accessories and Systems. Here at ICF We have a large Parts Store and keep supplied form our good contacts to the USA, ICF has access to all available USA RV parts. We always have a lot of Motorhomes in stock for Sale. ICF also can Import new or used RV products direct from the USA of nearly all American brands. We work with Brands such as Monaco, Beaver, Holiday Rambler, Gulf Stream, Heartland Big Horn, Forest River Fifth-Wheels and Travel Trailers, Lance and Cyclone Truck Campers and Toy Haulers manufacturer's, just to name a few. We will provide all information and assistance in the purchase of a new or pre-owned Vehicle. We have contacts through out Europe and the USA to help with your needs. Our sales department offers you access to a full line of Recreational Vehicles including Motorhomes (Class A's, Class B's, Class C's), Fifth Wheels, Travel Trailers, Truck-Campers and Toy Haulers. Quite contrary to our competing business firms we have been realistic. Still to this day we have not been caught up in the fad ( bigger is better ). In the past 28 years of our business, we have seen many American Dealers in Germany and Europe coming and going. By spending alot of work, ambition and staying power our company is proud to say we have and continue hold up longer than most of the other American RV Dealers in Germany/Europe. Please take the time to view our web site and inventory and be sure to contact us if you need any assistance or have any questions about us or our products.